All Are Precious In His Sight: Mattie's 90-Day Challenge! Sunday, December 26, I finished reading the entire Bible in 90 days. I got the idea from Randy Bohlender’s blog (randybohlender.wordpress.com). He had done it before and talked about it, but I never thought it was possible. Until he started his second time around, then I felt an extreme excitement. I kept telling myself, “No Mattie, you don’t have time. You’re too busy.” But I couldn’t say no to the Holy Spirit’s nudge. So, the next day I started the reading I once thought impossible. On my first day, I felt overwhelmed with the reading. It was 10-20 chapters a day. I really felt like quitting. The days seemed to fly by, until I was on day 80 and it hit me, I have read a ton of chapters a day for 80 days!! Only 10 more, it was possible! Finally, day 90 came around, and finishing climbing the mountain felt great. I learned a big lesson in perseverance. I also gained so much Bible knowledge. My favorite books as of now are Psalms, Esther, John, Romans, Philippians, James, and Revelation. Before this, I never knew the Bible was so action packed and real life. I can relate to almost every story, and I love it! I thank God every day for allowing me the privilege to read His Word freely. We live in a blessed country, don’t we? It’s given me a new passion and love for His Word. If you feel that Holy Spirit, you can sign up at Youversion.com, then click Read Plans, then scroll down to Bible in 90 Days. Be blessed! Selah (age 11 weeks in this photo) enjoyed listening to Mattie read the Bible aloud to her. We now have TWO GIVEAWAYS!!! 1. A sterling silver Boss Your Heart necklace hand-made and donated by Rachael Scott of The Vintage Lane. 2. A limited edition Boss Your Heart book signed by Lorraine. Join the Facebook Boss Your Heart Bible Challenge 2011 group. Click HERE. Share, SHARE, SHaRe!!! Encourage others to join the Boss Your Heart Bible reading challenge by sharing this on your blog/facebook/twitter/email, etc. You'll get 1 entry for each method you share! (Tell me how many times you shared it by leaving a comment on this post.) 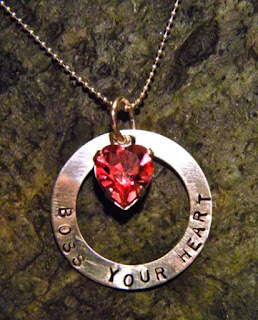 Let's work together to invite people around the world to "Boss Their Hearts" in 2011!!! Remember, the first day of Bible reading begins TODAY, but it's never too late to Boss Your Heart! Join up anytime, but you only have until 11:59PM on January 1, 2011 to be eligible for the giveaways!